Looking to make money as a ghostwriter? Then you need to know what the ghostwriting rates are in 2018. As with any market, prices fluctuate from year to year, and you need to know whether you’re getting ripped off. I’ve seen a lot of professional ghostwriters start their pricing at $5,000 for a full-length book (25,000 words and up). Pricing is based on the complexity of the book and the experience level of the writer. In the world of ghostwriting, you really do get what you pay for. Cheap ghostwriters are rarely native English speakers, so the writing you’re paying for will just sound strange to the average reader. And even if they do speak fluent English, they most likely don’t have the training or education that’s required to really make a piece of writing flow and connect with the reader. So if you’re a writer negotiating with a indie Kindle publisher, keep that in mind. I myself have different pricing structures, varying between rates by the day, the hour, the word count, and flat rates. With my background in management, I pride myself on being able to offer high quality writing at fair and flexible prices. Because each book is unique just like the site on which every building is built, it’s always best to just reach out for a custom quote. The more work that a client puts into the book, the lower the pricing should be. For instance, if a client has a very detailed outline that includes what happens to who, when, and where, the ghostwriter spends less time fleshing out the story and should therefore charge less for his or her services. Fair enough, isn’t it? The bottom line is this: Writer’s Market has done its research and the starting figure for ghostwriting rates in 2018 comes in at $30 an hour, or 50 cents a word. Want to know how much to charge for writing all kinds of things? Get the Writer’s Market Deluxe Edition today and charge for your writing with confidence. I got my start writing video game guides. They were extremely time intensive because I had to actually play the game and write down tips. The earnings per hour of work were abysmal. I eventually struck a deal with the publisher for a much more reasonable payment for another book. In fact, I actually looked him up and paid for his Kindle self-publishing course. And that’s how I came to understand so much about the Kindle publishing industry. Information is power. Arm yourself with the right information and you can increase your earnings as a writer. Right now, there are two major pieces of software that entrepreneurs use to find profitable books to commission and publish. They use this software to determine topics in which they can currently make money. You can use this software to set your ghostwriting rates. The great thing about all these software tools is that you only have to purchase them once. I did it myself and never looked back. I consider it a small investment in my future. And heck, when the day comes that I want to publish eBooks myself, it’ll come in real handy. If you want to know how much to charge for ghostwriting a particular eBook, you need to get this software. KDSpy is a browser extension for Google Chrome and Firefox. 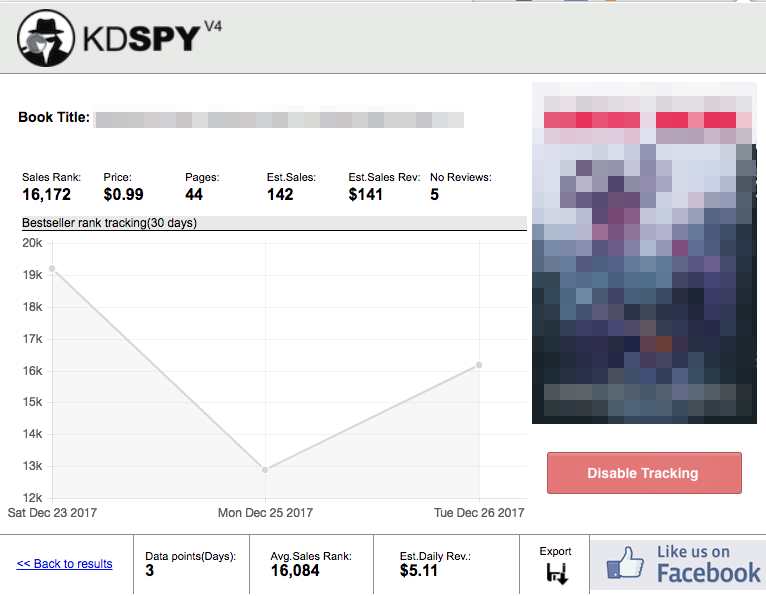 When you’re looking at a Kindle book on Amazon, you click on the KDSpy button and key information will be revealed to you within a matter of seconds. There are a few ways you can use this negotiate money from the publisher. For instance, let’s say you see an Upwork gig to write a romance novel. You can do some market research yourself and figure out how much the top 10 books are making in daily revenue. From there, you can extrapolate how long it’ll take for him to recoup his investment. For example, let’s say you check out the top 10 books in a certain niche and calculate that the average daily revenue is $10 a day. That means that in 30 days, the publisher will earn $300. Amazon takes 30%, leaving 70% for the publisher. That means they’ll get $210 in 30 days. In my opinion, that’s the bare minimum that you should be asking for. Sure, they have to pay for a book cover and other things, but it’s still a solid starting point for negotiations. That’s just one way that KDSpy can help you get the most money for your writing. It also has keyword research tools, but the next tool I’m writing about is better for that. Want to get more cash for your writing? Click here and learn more about KDSpy. This one’s a really great tool as well. KDP Rocket enables you to dig into what potential customers are searching for on Google and Amazon. This is a much more polished app than KDSpy. Rather than residing in your browser, it’s a standalone app on both Windows and Mac (I personally prefer that over a browser extension). The theory of keyword research in search engine optimization (SEO) is simple. If you want to be profitable, you need to know what people are looking for. That’s because people search for things they want. And if you can show up in their search results, you stand a good chance of making a sale. After all, people don’t search for things they don’t want. KDP Rocket beats KDSpy in keyword research. If you want to publish your own books, this will help you with your book title. If you’re ghostwriting for a publisher, this will help you get another data point on what to charge for the book that they’re commissioning. Do you want to ensure you’re getting top dollar for ghostwriting a book? Click here and start arming yourself with hard data using KDP Rocket. If you want to make sure you’re getting top dollar for your writing, it pays off to check out the competition and have hard numbers to back up your negotiations. Remember to never undersell your work. While there will always be other people who will write that book for less money, I don’t see any reason that decent writers should sell themselves out. The KDP market is huge and publishers can make plenty of money. If the publisher hiring ghostwriters has such a tiny budget and can’t come up to your price, you can bet that there’s a better publisher out there who has the business savvy to pay for the quality that you’re offering. The key is to arm yourself with as much factual information as possible so that you’re equipped to negotiate. If the Kindle book is in a lucrative niche, there’s no reason to sell yourself out. If they really can’t pony up the cash for the book, work out a deal with the publisher and come to a compromise . For example, you can ask them to give you a detailed outline to execute. This saves you time and effort on coming up with things to write. You can ask them for verifiable credit for writing the book. You can ask them for an open deadline so that you can write it in your spare time. Whatever it is, just remember to make it a good deal that’s set on your terms. Remember, they’re the entrepreneur and they’re the one responsible for reaping the rewards of the risks they take. But not every business decision will work out in their favor. They (should) know this. Protect yourself and value your work properly. KDSpy and KDP Rocket are just a few tools to help you do that. Disclaimer: I receive a commission if you buy the tools listed here. I’ve personally purchased and used these tools myself to negotiate for more money for my writing.